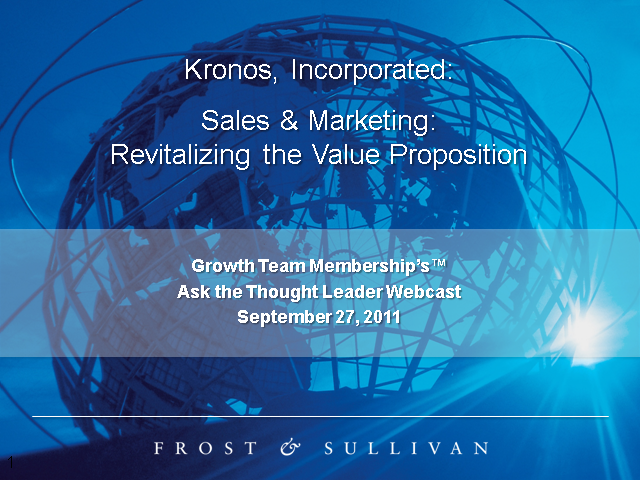 On Tuesday, September 27, 2011, the Growth Team Membership™ will present a case-based best practice on how the marketing function at Kronos collaborates with Sales to create and deliver a differentiated value proposition. Featured Thought Leaders: Charlie DeWitt, VP of Enterprise Marketing and Tim Riesterer, Chief Strategy and Marketing Officcer will share key lessons learned and participate in a Q&A session. Keith O'Brien, GTM;Charlie DeWitt, Kronos Inc.; and Tim Riesterer, Corporate Visions Inc. Presented by: Keith O'Brien, GTM;Charlie DeWitt, Kronos Inc.; and Tim Riesterer, Corporate Visions Inc.